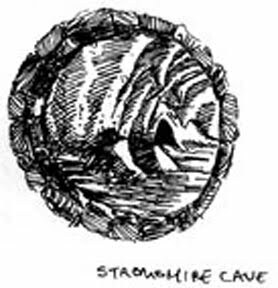 A warm wind blows from Stromshire cave every morning from sunrise for the first few hours of the day. In the evening, after sunset when the land cools, air is drawn inwards. Local legend maintains that the breath is caused by an enormous dragon living at the very bottom of the cave where a rockfall caused by a regional hero trapped it. Bennick the Sage, a feature at the local taverns, maintains that the cave itself is alive and breathing, and that it may one day take up other lifelike passtimes, such as eating or getting up and walking. Naturally the place includes the other common features of a dungeon entrance: rumors of lost treasure; missing adventurers; the occaisonal monster raid... but the mystery of the airs remains for now a mystery.